Mainly material: soft plastic Headset; metal cover. Compatible with: ISO, Android, Windows Devices and so on. Please do not expose the headset under direct sunlight while charging, especially when environment temperature is high. Please fully charge before the headset is idle for a long time. Charging voltage: 4.2-5V. No more than 5V! Overvoltage will damage battery. Note: Keep installing ear-hook make signal stronger and more stable. If any problem or unsatisfied, be free to contact us, we guarantee 12-months free warranty and 1-months returning. 【COMFORTABLE &ULTRALIGHT】Equipped with soft earbuds and 360°adjustable& detachable ear-hook to the most comfortable fit of right or left ear. 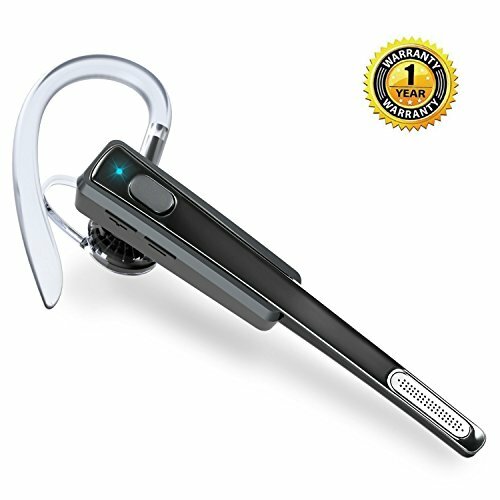 Moreover, Hands free ear-hook design allows you to enjoy the pleasure of calling, music and GPS directions. And it weights only 0.4 oz greatly decreasing wearing burden. 【SUPERIOR PERFORMANCE】With the function of SIRI voice prompt, calling number voise prompt, mute switch, 1 to 2 connection and re-connection. And, one key to Power on/off, answer, reject, redial and pair with bluetooth devices. Connection range up to 33 feet. It's sweat-proof and splash-proof, no pressure for working in the office or at the gym. 【HIGH QUALITYSOUND】Bluetooth 4.1 technology, equipped with CSR chip and APTX provide crystal clearsound and strong signal. With Noise Reduction boom microphone and Dynamic Speaker broadcasts your speech clearly in a noisy environment or in a driving environment. 【WARRANT& SUPPORT】If any problem or unsatisfied, be free to contact us, and this headset support 12-month free warranty guarantee and 30 days returning or replacement. If you have any questions about this product by SHNOKER, contact us by completing and submitting the form below. If you are looking for a specif part number, please include it with your message.